Bullying Recovery, LLC, 9780996331302, 204pp. "I dug a deep hole in the back of my mind to place a shoebox of all the bullying memories that happened to me growing up in Lexington, Massachusetts. By making this hole and burying these memories, I hoped to forget what had happened to me and move forward with my life. I covered the hole with a lid and spray-painted the words "ANXIETY and DEPRESSION. DO NOT OPEN "
This true and inspirational story of Alan Eisenberg's life offers a raw and honest portrait of a bullying survivor and takes you on a journey that, in the end, leads to recovery and solutions to help heal from the trauma of the long-term effects of bullying. The issue of the long-term effects that bullying has on people is brought to life through Alan's story and how he tried to suppress the childhood trauma brought on by bullying, but finally had to confront it when anxiety, self-esteem issues, and finally depression set in. How childhood bullying affects us into our adult years. In his quest to find answers to what happened in his early life, Alan shares his discoveries of what Complex Post Traumatic Stress Disorder (C-PTSD) is. How you can recognize it's symptoms. Alan also shares how we must learn to make peace with the past to move forward. Additionally, Alan shares how he dealt with the anxiety and depression that came from the bullying he endured. 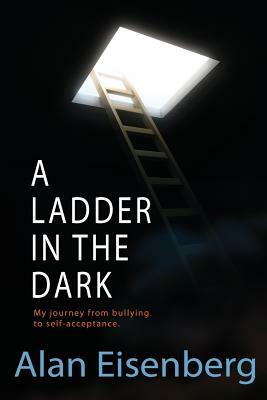 How he found his Ladder in the Dark to climb up it to help recover from the long-term effects that bullying can create to recover his self-esteem. It is powerful and unforgettable story of one person's journey from being a bullying abuse victim through a journey of confronting their past to regain their authentic self.